Level-5 has made more than its fair share of fascinating and lovely titles over the years, from the unique mix of genres that was Dark Cloud to the Ghibli RPG of Ni No Kuni. One franchise that has been a stable for the studio is the Professor Layton series of puzzle adventure games. Starting way back in 2007, the series provided fun and portable puzzles to solve over the course of several entries, but many have been wondering what the hold up is for something new in the Layton name. Well, that something new is finally on the way, with Professor Layton's daughter taking the helm for her own adventure this summer. Formerly titled Lady Layton, the newly christened Layton's Mystery Journey: Katrielle and the Millionaire's Conspiracy will be launching on July 20. While the 3DS version has only been announced for Japan, the iOS and Android versions will be available worldwide. 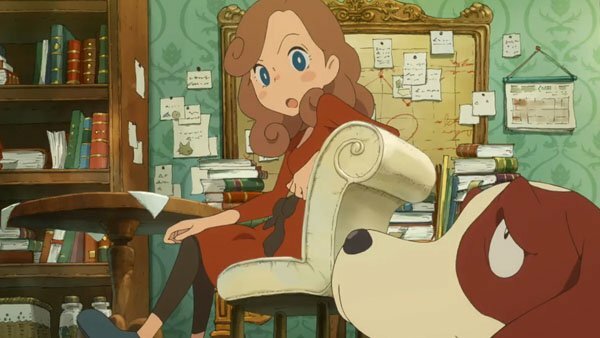 This entry will apparently revolve around Katrielle Layton taking on cases with her partner, Sharo the talking dog, as she searches for her missing father. It's difficult to nail down more specific details with all of the relevant information being in Japanese, but if you're a fan of previous Layton titles then I doubt you need much encouragement to jump onto this when it releases. The 3DS is home to a great many other awesome games as well, so why not check out our Best 3DS Games guide?